Simply put, “smarketing” is the integration of Sales and Marketing working together to further one common business goal. HubSpot helps to define this more clearly by exemplifying how smarketing could work in companies. Your Marketing team might a lead generation goal or revenue pipeline to reach by mutual agreement, while your Sales team has to agree to follow a specific amount of those leads. Smarketing involves both frequent and direct communication between the two departments. In fact, having a strong alignment of your Sales and Marketing departments can see your company improve annual revenue growth by 20%. HubSpot underlines just how important smarketing is for inbound marketing – something we also believe in. In fact, did you know we’re HubSpot Agency Partner Certified? For smarketing strategies to really work, your Sales and Marketing departments need to have weekly and monthly meetings. Think about it: how will your teams know they’re working towards goal success? They need to be on the same page and share information weekly, with the key managers also having more in-depth, monthly meetings. Start with a shared goal: revenue. The Sales team will know the amount to strive for and the Marketing team will know how many leads are needed. Strengthen relationships and overall efforts by integrating your software, so that both Sales and Marketing teams can see each other’s activities. Communication is vital for smarketing to work. Both teams need to be confident and comfortable to let each other know what’s working and what isn’t. Start with the total amount of earnings you want to reach and divide it by the average earnings per client. Then you’ll know just how many clients you need to reach your sale quota. Simple, right? Once you have the number of clients, you can calculate the number of leads you need. All you have to do is divide the number of clients by the close rate (%). Out with the old and in with the new – or should we say, out with the funnel and in with the flywheel? HubSpot retired the funnel and has now adopted the flywheel to build up trust, credibility, and momentum through every step of the customer’s’ journey. This new and powerful growth model adds value to your inbound marketing strategy. 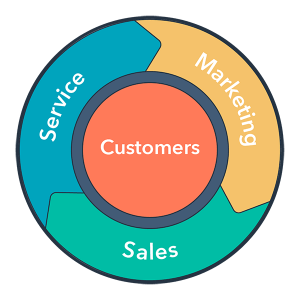 We can help you develop a flywheel from your funnel, which will make it easier to align your Sales and Marketing teams. 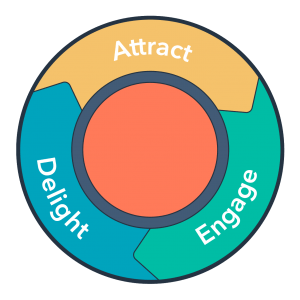 You will then create strong relationships with every customer through the three steps in the flywheel: attract, engage, and delight. As technology advances, so do we. We take full advantage HubSpot’s expert software to help manage customer relationships, sales, services, and marketing. Align your smarketing efforts with customer personas; understand your customers and you’ll find it so much easier to integrate Sales, Services, and Marketing efforts. A closed-loop integration strategy helps the Marketing team measure results more efficiently, allowing for lead management through the buying process. This results in the Sales team having a higher amount of highly-qualified leads, which results in a better perspective on how leads are generated and which channels are more effective – increasing conversion results. Receive regular updates on contact information. Gain statistics and reports to know which communication processes are effective, leading to a ROI increase. Identify which channels result in more leads and customers. Understand how to prioritise leads ready to close, providing an increased close rate. Provide information about their interactions with a contact. Receive alerts automatically every time a lead that the Marketing team identified decides to engage with your business. HubSpot CRM allows for data viewing on leads and on all your tools. You can create a common dashboard and share it with the Sales and Marketing teams, aligning them with their goals. Dashboards should be transparent, public, and checked frequently. Progress can then be measured and communicated so that both teams reach their primary goals, as agreed on the SLA. The volume of leads or the volume of quality leads against the monthly goal. Leads by source and by campaign to know exactly what’s working to drive leads, traffic, and customers. Volume and type of MQLs being generated. Sales goals month by month. Volume and depth of leads being followed up by the Sales team. Why be unsure of how your smarketing efforts are working or not, when our team of experts can help you streamline your business process automation?